Description: Learn the essence of drawing by balancing observation with mark making. Reinforce concepts with four drawing exercises. Day 2 very interesting. I did not understand in exercise #4 why you had to keep your pencil down the entire time? This is an exercise to improve drawing. Enjoying the updated version of these beginning lessons. Thanks! These lessons are new, but the concepts of drawing remain the same. Some of the information from this course you may have also seen in other courses. Loving this. Always good to go back to basics now and then. Looking forward to the next days’ lessons. Having problems with lesson 2 …. can’t get past the one and a half minutes…. just a black screen with a white circle spinning! Hi Jo-Ann, The video is playing normally. It sounds like the video is buffering for you. This occurs when your internet connection is weak or your connection is inconsistent. You may try changing the video quality by scrolling over the video and clicking on the gear icon. Try playing the video at a lower resolution. Thanks for the lesson. I enjoyed the review. Hilarious! 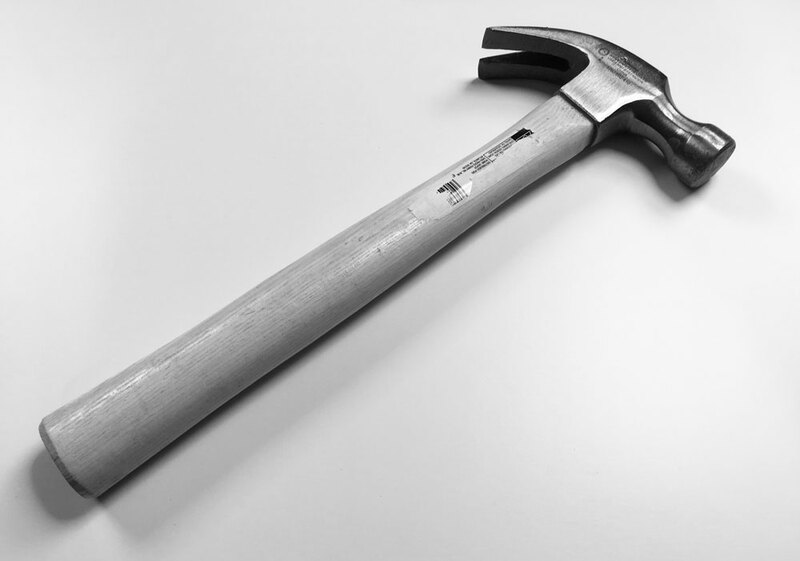 I drew a sledge hammer >.< – Struggled with the continuous line drawing as I was drawing each item continuously :/ I needed to watch what the words actually meant. So I will attempt them again as suggested but drawing the form without taking my pencil off the paper. I think some of the struggle is that it does go against everything I thought I knew about drawing lines! So point to me for learning something new today 😀 Thank you very much for putting this course together. It works perfectly with two others I am currently observing. I love this course! But I would also be VERY exited if there would be a course like this i watercolour! I believe that there is not very much here on that subject…. I have…but do you have any plans on going forward with the watercolour section? Yes, we are always adding new content. Watercolor is one of the core mediums that we cover. Dear Matt, I am very happy with the two lesson here, and I did the exercises, but I have a problem keeping the pencil on the paper because I’m left-handed, and the things sometimes are better from left to right. Please, give me an advice. This exercise is equally challenging if you are left-handed or right-handed. If the paper is moving or if it is difficult to make marks, you may try taping the paper to the surface that your working on. This may make it a little easier. I can not access any lesson, is there a problem ? Are these lessons for total beginners, like someone who has never really drawn before? All of our courses begin with the most basic principles. We don’t skip anything or make any assumptions. The lessons become more challenging as the course progresses. I really enjoy exercises like these, I’d forgotten! 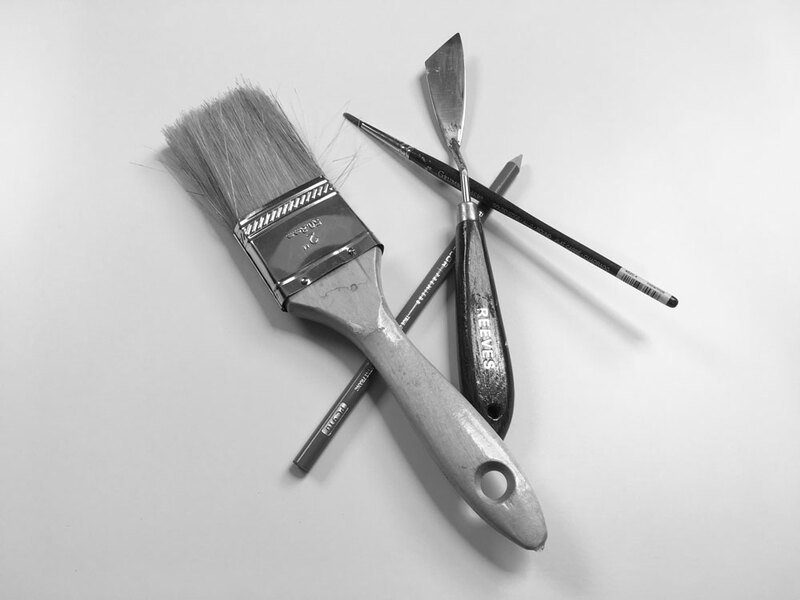 My brush handle and knife handle didn’t quite meet up in no 4, but never mind – onward and I hop upward. Realmente o exercício 4 com a linha continua e o não levantar o lápis é o mais difícil pra mim. Mas, estou confiante e empolgada para concluir os 25 dias desenhando. Sim, muitos dos exercícios são desafiadores. Nós crescemos com todos os desafios. Você consegue fazer isso! I think I press down too hard. I used 2B should I go to another such as HB. My continuous line drawing still looked strange but I get the concept! Thanks. Really enjoy the instruction until I can get into another class here. 1st day. My work came out pretty satisfactory. Loving it so far. My 1st day. My work came out pretty satisfactory. Loving it so far. thanks. I learned Something new and It gives me hope. Thank you! WOW……….Day 1 and 2 were pretty amazing for me. I will be 76 next month and I can draw a shoe and hammer, well sorta of, but I am still excited for all of the next lessons. Thank You for making this learning program. now i know why continuous line drawing is useful – training between observation of reference and point of action in drawing. I am an absolute beginner. So Which course should start first? Please advise. The Secrets to Drawing is great place for absolute beginners, but this course is also suited for beginners. 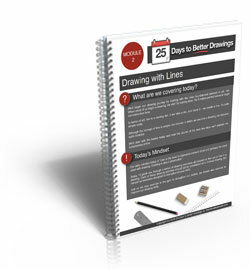 25 Days to Better Drawings is probably better for “advanced” beginners – if this makes sense. You’ll get quite a lot from either of these. Great lessons Matt. Think I will repeat day 2 again before moving on. I was way too slow on the continuous line drawing section and kind of messed up the relationship of objects. Will pause the video next time and finish the drawing before wrapping up the video lesson.